It all started in a small Dutch field not far from her home. That is where Liz Barclay as a four-year old preferred to spend her time dreaming of riding a little fat Shetland. It became the red thread through her life. 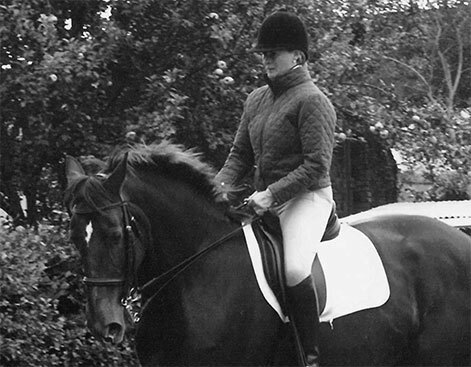 Her love for horses together with her dedication made her into the trainer and dressage rider she is, today. 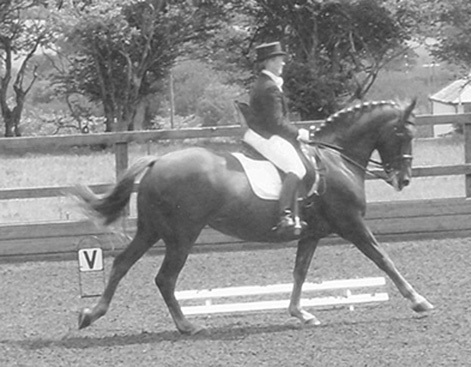 She is versatile and inventive and likes a challenge; whether it is a technical training question, a confidence issue or a problem involving the management of the horse or pony. 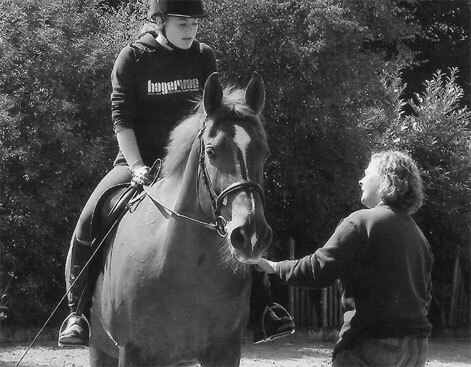 The mix of working with all ages and also her interest in all aspects of riding, including `hacking a horse in a friendly and balanced manner’ keep her fresh and motivated. The first time I saw Audrey Cole was some thirty years ago, when she was more or less galloping back to her horsebox after her dressage test at Lanhydrock where I was stuarding. She was brightly lipsticked and in full flight, but still managing to pass on some information to some of her groupies. Roughly ten years later, I drove into her meticulously clean and well-organised yard for our first lesson together. Afterwards, when I of course had to come in for a cup of tea, Audrey told me about her beloved Spike, the Intermediate event horse she lost not long before and the one she probably was riding that time at Lanhydrock. She talked about him with such adoration and respect, that I knew that this was a woman who loved her horses deeply. Another ten or so years later, I had a phone call from Audrey, ‘Hi Liz, I’m organizing a charity ballroom dance evening in aid of Parkinson’s UK and I thought it would be fun to have some dance lessons with a group of people. You can join with Paul Martin.’ Audrey didn’t need an answer. She simply expected me to join in and my farrier Paul Martin, too. Some 20 odd of us danced all winter, learning the Cha Cha Cha, the Jive and the Waltz. I still look back at that winter as one of the most fun times I ever had. The evening itself was spectacular, hilarious and made a vast amount of money. This was one of many charity events she organized, and I do suspect that Audrey’s favourite thing was dressing up. She always looked absolutely gorgeous, with her husband Alan in his Tux next to her a proud man. Audrey had strong opinions, and even if my opinion was different, I admired her drive and commitment to stand for what she believed in. To complain about things without doing anything about it was not her style. Didn’t she knock on doors during election times, even stopping cars, just to keep the hunting going? There was something else that I noticed during the years I knew Audrey. She would always help the underdog, as long as there was attitude. She helped numerous youngsters to get their feet on the ground in a very quiet way. No one needed to notice. So, it is clear, whatever Audrey did, she gave it 200 percent. She was larger than life in every way. 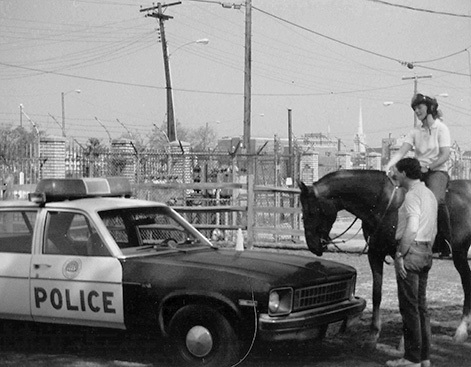 Whether it was her job with the police, her horses, her friends, or creating a lifestyle for Alan and her that never allowed Alan’s illness to keep them from having fun. She did never make it easy for Alan and her, never took the easy route. It must have been so hard at times for both of them, but she made sure we never got to see that bit. 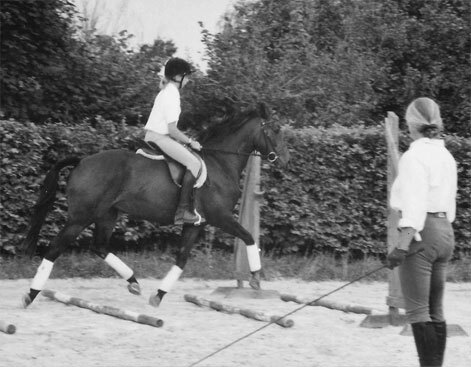 I so hoped that it would have been a long-term relationship with Audrey as the owner, Adrain as the rider and me as the dressage trainer, but it wasn’t to be. The horse she and Adrain adored turned out to have a complex spinal issue and sadly didn’t make it. So, that was the very last time I saw Audrey. With a dinner plan in the making I drove home, no idea I would never see her again. I want to remember her like that. Brown as a berry, big smile, in her sarong with a bowl of blackberries, waving.